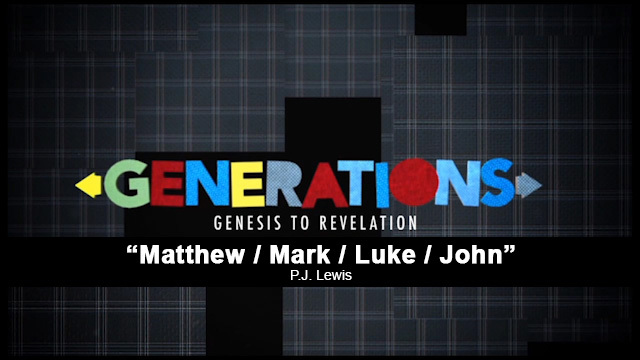 We pick up our Generation series with a leap into the New Testament, and a look at the Gospels: Matthew, Mark, Luke and John. Many say these books all cover the same thing – the life of Jesus on earth, and in particular, His three years of ministry and His death, burial and resurrection to provide salvation for humanity. And that's true. But there are also differences between the Gospels that, once understood, can provide a clarity and appreciation for each individual book, and for the person and work of Jesus Christ. We will point out some of those themes and distinctions this week. It is generally accepted by tradition that Matthew, also known as Levi, the despised tax collector in Galilee and apostle of Jesus is the author of this Gospel. As early as A.D. 45 and as late as A.D. 80. The date is greatly debated based on supposition and circular reasoning. Jesus met all the genealogical requisites, had the platform as King Messiah and demonstrated He was the Messiah. The Old Testament is Jewish in nature and so is Matthew’s account of the life of Christ. The original writing was in Hebrew. Matthew’s account is not in chronological order for the most part, but is written to thematically present the life of Christ to his audience. From beginning to end, Matthew depicts Jesus as the promised Jewish Messiah. It is generally accepted by tradition that John Mark, the younger cousin of Barnabas, is the author of this Gospel. As early as A.D. 45 and as late as A.D. 80. Between A.D. 50 and 65 is most likely. The date is greatly debated based on supposition and circular reasoning. Jesus came as a suffering servant, humble in heart, offering Himself and training disciples to spread His redemptive story. Mark (John Mark) was well connected to the apostles through his cousin Barnabas and served as a scribe and interpreter for Peter. Because of the amount of time he spent with Peter, it is generally believed that this account is mainly a reproduction of the message Mark heard Peter tell firsthand many times. However, Mark was also very close to others in the inner circle of those who had seen and been with Jesus, which might explain why Mark includes so many interpersonal details about the people with and around Christ – more details than any of the other Gospels. Luke, the physician and only known pure-Gentile author in the New Testament. He is also the author of Acts. Likely between A.D. 57 and 65, after Matthew and Mark were written. The date is greatly debated. Some would put the date of the book after the fall of Jerusalem in A.D. 70, but the nature and content of this well-investigated and consecutively ordered account of the Christ suggests it was earlier. Jesus is the Prince of Peace for the whole world, the One who has compassion on all, offering Himself to the world. Luke was a trained physician who never saw Jesus personally, but as an adept student, he carefully investigated all the accounts of Jesus’ life from the eyewitnesses and then compiled a sequential account of the life of Christ – the only such account of the four Gospels. He interviewed many eyewitnesses, including disciples, friends and relatives of Jesus. It is noteworthy how Luke tells what a person was thinking and feeling in their heart and mind, not just what they said or did for others to see and report. One instance of this is in the account of Mary the mother of Jesus in Luke 2:19. John, the brother of James, the son of Zebedee, the apostle that Jesus loved. He is also the author of 1, 2 and 3 John and Revelation. Most likely written between A.D. 90 and 95. It is impossible to date the writing of the Gospel of John with any exact precision. However, most agree that John was written later than any of the other Gospel accounts. Jesus was sent into the world to give God’s hope and love to anyone who receives His gift. This Gospel account is much different from the first three. John seems to be concerned with the philosophical and theological influences that were beginning to have a detrimental impact on early Christians. The philosophical bent of this Gospel can be a reflection of the author, as well as the rise of Docetism and early stages of Gnosticism. This account reflects a desire to be clear and concise with the audience that was probably a mixture of Jews and Jewish Christians, as well as non-Christians.